Our latest stint of recruitment unfortunately coincided with me being away for family concerns, so recruiting feels like it’s taking a little longer than usual. I’ve written about recruiting being hard this expansion before (harder than I’ve ever seen) but I’ve been thinking about this a great deal and I’ve started to isolate some specific factors. It’s pretty interesting, actually. In a strange way, we’ve contributed to making things difficult for ourselves. Back when we were a “strict” ten hardmode guild, there weren’t that many out there. Kae over at Dreambound was my ‘strict ten’ buddy in the blogosphere, and perhaps there were others but I didn’t know about them. Some people expressed confusion about the strict ten ethos – why deliberately avoid acquiring gear that would make your encounters easier? For us, strict ten was a specific challenge. Hardmode tens encounters were often overtuned or designed in such a way that they were afterthoughts to the 25-man version, or ham-handed adaptations. Doing the heroic Lich King encounter while wearing tens gear meant something. It took ages for anyone in the world to even do it, and then it took longer for more groups to follow. (In the interests of full disclosure, we defeated H LK following patch 4.0, so it was easier than it was for people who did it prior, definitely. But it was still an achievement). Strict tens guilds faced challenges in many ways. Recruiting was difficult because you were seeking players that wanted to do hardmodes and had the ability and will for them, but many such players gravitated towards 25s and considered tens the more ‘casual’ raid size. That was a hurdle we managed to overcome by appealing to that niche player – burnt out 25s raiders who wanted a smaller format, or people who were just a bit offbeat but still didn’t want to waste their time. A “serious” tens raiding guild seemed like a contradiction in terms to many, but we managed to bring in players despite that. Some of them were those seeking 25s that I managed to convince, others were those who wanted a tens environment on their own, and we built something we could all be proud of. Having secured a roster, we faced other challenges – the perception in the community still being that tens wasn’t “real” raiding. 25s would farm our instances for gear (things like the trinket from H Gunship 10) all the while laughing at how easy tens were. But naturally, they had a significant gear advantage as they did this. This all changed with the adjustment to raid lockouts, something that I know a lot of 25s players weren’t happy about. Rather than doing “this AND this,” suddenly it became an either or choice. You were either raiding tens, or you were raiding 25s. 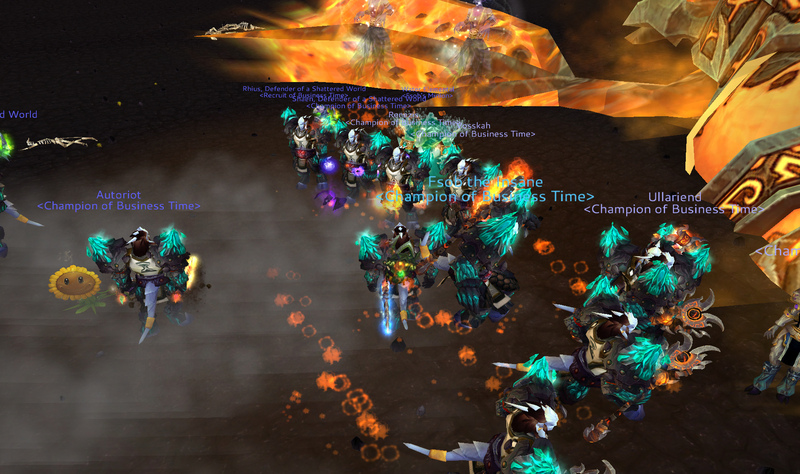 But ICC was hard on people, and many players in our guild teetered on the edge of burnout as Cataclysm loomed. Overall, we were ecstatic with the announced changes – shared raid lockouts meant that tens were a viable progression track and not just a place where 25s players went for an alt run or to let their hair down on the weekend. The announced changes to gear distribution in Cataclysm were amazing. We’d no longer be at a gear disadvantage, which meant that there would be less reason for people to turn up their noses at tens! Balance would be less of an issue (they could balance around existing gear because it’d be the only gear there was). It was like a tens raider’s wildest dream! I remember being giddy and feeling like our efforts as a strict ten had finally paid off. We’d stubbornly insisted on treating tens as the viable progression path we felt they were, and finally Blizzard was acknowledging it, too. In a twist that strikes me as truly ironic, though, what was our wildest dream has also turned out to be a bit of a nightmare. I feel like I am Hipster Guild Leader. “Hipster GL knew about ten-person raids before, but you probably haven’t heard of them.” In Cataclysm, everyone knew that tens would be getting the same loot. They’d even be eligible to make legendaries (something that hadn’t been true ever before). They already shared a singular lockout with 25s, and a raiding populace burnt out after six months of ICC flocked to ten mans in droves. I remember hearing about 25s guilds splintering into several groups, or forming up an “elite” team and leaving their other members in the dust. Ten man hard mode guilds sprung up like weeds, and suddenly our pretty small pond of tens raiding guilds was flooded. Ten person raiding went mainstream. What did this mean for a hardmode tens guild that had been raiding tens since April 2009? It meant that suddenly there was a whole lot of competition. We went from being this odd little guild of people with the funny notion about tens to being one in a crowd of tens guilds – a single fish in a vast school of swimmers. Our server now has only tens progression guilds. All of the 25s guilds either folded, splintered, or downsized. The raiding world saw tens and saw that they were good. If tens raiding was our little indie band, suddenly we were hearing it on the radio twenty times a day. We were a pop hit. We no longer had our elite strict ten ranking to use as a recruitment tool. At the height of our achievements, we were ranked tenth in the US (among strict ten guilds) during ICC. This was an awesome way to attract the kinds of players that we wanted. That method of recruitment was gone. I removed the ranking from our recruitment ad, because it’s not impressive anymore. We’re not in the top ten, or even the top hundred. There are thousands of guilds doing just what we do. The strict ten ranking was an odd thing that has engendered more than one debate over the past few years. The strict ten designation was very restrictive; it operated by counting the number of people in your guild who’d achieved a particular kill (25M Marrowgar, for ICC). Then it set an arbitrary limit, e.g. you could have seven people in your entire guild who’d downed 25M Marrowgar, but any more would disqualify you from being a strict ten guild. This meant that some people’s alts couldn’t join the guild. We maintained this level of monitoring for a long while, because it WAS one of our strongest recruitment tools. We had a big discussion in the guild about keeping it or letting it go, and we decided to ultimately drop the ranking (although we didn’t actually obtain any additional gear for our H LK kill so I still consider it pretty strict. Maybe strict-ish). The problem for me all along, I’m realizing, was a shift in how and why we considered our rankings. Were they a tool we maintained for recruitment? Or perhaps did we fall a little bit in love with that number, and that spot? I can’t use our ranking as a recruitment tool anymore. So why was I checking it all the time? Also, what is our strongest selling point in a market that is 1) shrinking all the time, and 2) has an abundance of choices to buy what we’re ‘selling’? The big problem for me personally is a saturation of information. Twitter and blogs allow us to be connected to fellow players more than ever before. Heck, I have Twitter on all day long and when I’m not home I have it on my phone. Thus I’m in a position to see messages come rolling in like, “Just killed x boss,” or “Finished the entire raid!” and anything less than that feels like a personal failure. I actually think the raiding community is a lot smaller than we think it is. Lately I’ve been seeing a lot of “coincidences” in the form of raiders joining our guild who used to raid together, or people leaving to join another guild that someone else is in who I am personally acquainted with. I think it’s more than just coincidence, it’s the fact that our pond is actually a lot smaller than we think it is. Which is part of the “too much information” syndrome. For me, it’s a strange process. I have to consciously examine the facts of the guild at another point in time: We had very little turnover for a year. Our roster was stable. We had much less competition. We also used to raid four nights. A stable roster meant no readjustment period with new people coming in. It meant most people had experience with the same fights. We knew we were at a gear disadvantage, and perhaps that had a psychological impact as well. When we needed to recruit, we could point to our GuildOx ranking as a way of saying, “Look, we have credibility.” We were doing hard mode progression raiding with an adult roster of friends and dedicated raiders. Then I have to consider the facts of the guild as it stands: We’ve had a ridiculous amount of turnover (in my mind) since Cataclysm started. We lost almost all of our healers, several tanks, and have had a veritable revolving door of DPS. But we only lost them to general disinterest in WoW, not to our guild personally. We downsized to three raid nights at the end of Wrath, so we have one less night and three fewer hours than we used to. 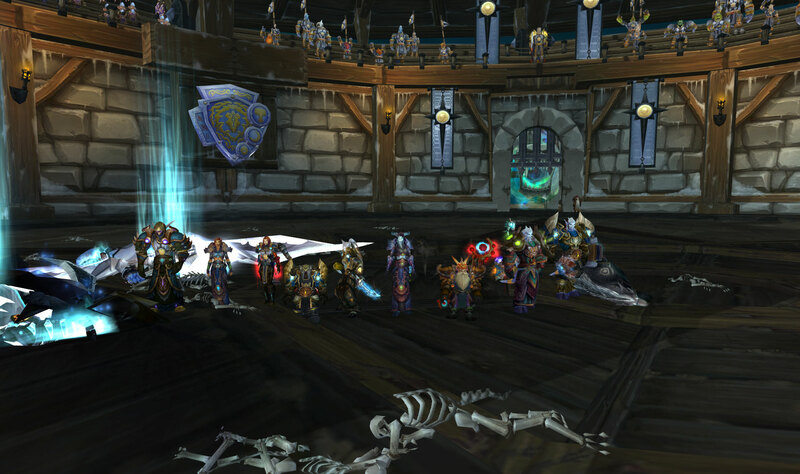 Our roster raids less overall, and thus doesn’t master fights as quickly as they once did. Our old biggest selling point (GuildOx ranking) is no longer applicable. I think one of the biggest things we have to recommend us is that we are a stable guild (despite roster turnover) and have been so for going on three years. We still are doing hard mode progression raiding with an adult roster of friends and dedicated raiders. At the end of the day, I have to recognize that Business Time – like any group of people – has changed over the years, and that isn’t necessarily a bad thing. We’ve all gotten a bit older, and/or recruited people who are older. We have jobs, girlfriends, wives, family obligations, children. We adjusted our raid nights to reflect that, and it’s impossible to pretend that wouldn’t have an impact. I should note, this isn’t an invitation to tell me all about how YOUR guild does xyz in x number of hours. I’m happy for you, but I’m talking about my guild, and the expectations or achievements of one guild can’t be applied to another. There are no rankings for things like dedication, maturity, longevity, and the ability to tease Voss. For the record, as far as I’m concerned we rank pretty high in these intangibles (especially teasing Voss). We are still dedicated to progression within the time allotted to us, and I think it’s important that we focus on what we’re doing, instead of constantly having one eye on server rankings or Twitter. And yes, I’m mostly directing that statement at myself. I took GuildOx off my quickbar bookmarks. Not because I don’t care if my guild does well (I do) but because I want to focus on what we’re doing. I think I’ve let myself be distracted by things that are of lesser importance, and that I need to focus on one boss at a time instead of always bemoaning what we didn’t do. 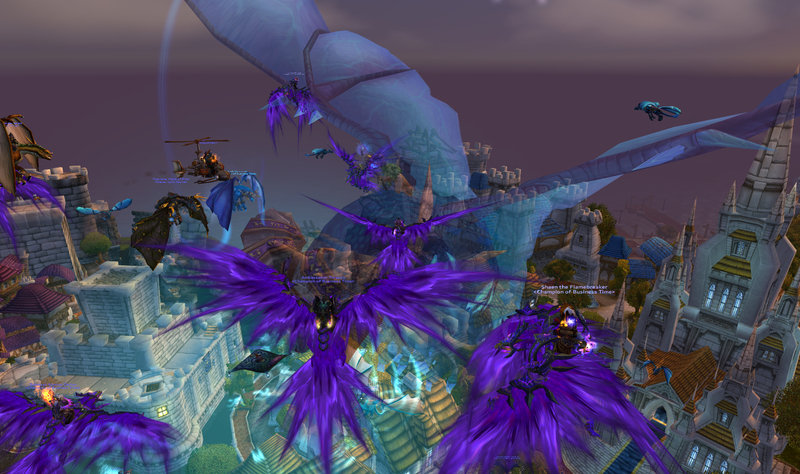 We earned those purple birds last tier, we have a blast raiding three nights a week together. I am damn proud of what my guild does, that it’s managed to stay together and reasonably stable for all of this time – that even though we have to search really hard sometimes, we can always find the right people that want to be part of BT with us. This is your Business Time. There are many like it, but this one’s yours. (It’s not a Booterang, although that would make kind of an awesome guild name). Finally, an entirely shameless plug, we ARE still recruiting and the link above will take you to our post. We’d like a shadowpriest or moonkin, ideally, with a working resto off-spec. We did find a paladin tank so we’re halfway to our recruitment goal! Last but not least, tell me about your experiences this expansion. Has your recruitment gotten harder? Did you change raid sizes? Are you happy with the change? Hey guys, I don’t usually say this but I apologize for the blog silence this week. I had plans to write a post this weekend but a multitude of things prevented me, and last night my very elderly grandpa fell and hurt himself. He isn’t looking likely to make it so I’ll be AFK for an indeterminate period, at least a few days. In the meantime, I wanted to mention that we are recruiting and repost our recruitment ad to reach a wider audience. I’d really love to find players who are a great fit for the guild and type of raiding we do. Meantime, From Draenor with Love has a few comics lined up without me doing any more, but I don’t have anything planned for the blog. If you have an itch to write a guest post, I’d gladly take a post or two to put up here while I’m away. You can e-mail one to me at puggingpally AT gmail DOT com if you’re so inclined. Other than that, if you’re looking for a guild, maybe we are the right guild for you! Thanks for your understanding as I let Manalicious take a brief pause. p.s. – I was on Blessing of Frost this week with Kurn, Majik, Beru and Stoneybaby. There are a few sidesplitting moments (I think, at least my side was split). It’s well worth checking out for Beru’s moment of glory alone! Business Time is a hard-mode focused ten man guild. We raid 9 hours per week and are 6/7 HM in Firelands. Raids are on Monday, Wednesday, and Thursday from 6-9 PM PST. We are currently seeking two exceptional players to join our team of dedicated raiders. This is a unique opportunity to join a small roster of adults committed to performance but with a friendly, tight-knit atmosphere. You are an exceptional player of any role. We’re able to accommodate either a tank, a healer, or a DPS. Regardless of which role you’re filling, above all what we need from our new members is flexibility. If you are a tank, willingness and ability to fill a DPS role if needed is an asset. Similarly, you earn major points for being a healer who can also DPS on the odd night, or a DPS with a competent healing off-spec. Paladin, priest and/or warlock applications may be given special consideration because of token distribution but above all we’re seeking the best personality and skill fit for our group. – You are a player dedicated to excelling at your class and follow the latest theorycraft. – You’ll always research strats (and will discuss or at least read strats on our forums in-between raids). – A raid never catches you unprepared – flasks, food, fully gemmed and enchanted – you treat your gear with care because you want to do the best you can, not because you’ve been told that you have to. – You’re interested in finding a like-minded group of people who are serious about tens. -The ability to experience hard-mode content in a relaxed atmosphere. We believe in accountability for our raiders, but we’re adults and treat each other as such. -Progression raiding with good friends. Whether we’re hitting the BGs together or going to visit old content, we’re happiest when we’re doing it with our guildies. Business Time is a progression-focused tens only guild based on Moonrunner US (PvE, PST). We’ve been a guild for 2.5 years and we’ve raided strictly tens for all of that time. We chose to raid exclusively tens because we enjoy the challenges of additional responsibility being on every member, and we like to know the people we raid with. We are a group of adults (ages 22 to nearly 40) that don’t have an infinite amount of time to devote to raiding, so when we raid – we aren’t there to mess around. At the end of Wrath we finished out the expansion with Bane of the Fallen King after acquiring Frostbrood drakes back in June. We were in the top ten “strict” rated guilds in the US at that time! Presently we’ve completed 6/7 heroic mode encounters in Firelands, finished up Glory of the Firelands raider, and we’re ready for Dragon Soul! We raid Monday, Wednesday, and Thursday from 6-9 PM PST. We are a no-drama, low-turnover guild that has stayed strong for two and a half years now. We’re looking for long-term members who will stick around and continue to make our guild a great place to be. If you like what you’ve read here and are thinking of applying or you have further questions, please don’t hesitate to ask here in this thread. You can also roll an alt on Moonrunner to chat with us – look for Millya, Vosskah, Yahwen or Shaen, or ask any member of Business Time for an officer. 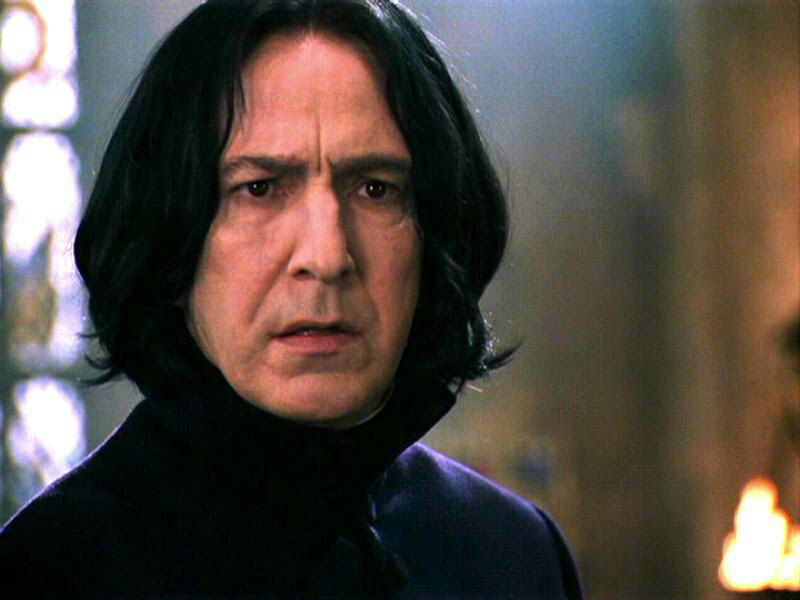 It’s a running joke in our guild that the warlock “position” is like the Defence Against The Dark Arts teacher. When I joined, we had a warlock. He left in a fit of pique after his performance was called into question. I’m not going to share any more dirt than that, though. The end result was one down! We found a replacement warlock who was pretty impressed with his own importance. More importantly, he never signed up for raids on time. When he was called on this, he left citing “personality differences.” Two warlocks gone. Our third warlock was actually a hunter who switched to play his warlock. As a casualty, this was the first one I can take semi-credit for because we had some conflicts, he and I, after I assumed guild leadership. By that time he was playing a shaman, but I think he played his warlock for the longest, so in my mind it counts. Third warlock, gonzo. Our fourth warlock started out as a warrior DPS and switched to give us greater access to ranged players. He was there for our H LK kill, but switched to playing his DK at the beginning of Cata (and ultimately stopped raiding). Goodbye, ex-warlock the fourth. Finally, our most recent warlock, who is an all-around great guy and fit in really well, has reached the end of his WoW career and decided to hang up his hat. I can’t do anything but respect his wishes, of course, but I’d be lying if I said I wasn’t sad to see him go. He was like the dream warlock. I should have known it was too good to be true! So that’s five warlocks, all of whom lasted either a short while before leaving, or switching characters, or switching characters and then leaving. What I want to know is, what is it about warlocks? I grant you that mine is anecdotal evidence, but there’s no single class with higher turnover in the guild than warlocks. We’ve had the same mage(s) for almost two years. Our shaman is rock-steady, as is our druid, and even folks who stopped playing still stayed for a really long while with the same character. I have a few crackpot theories. Crackpot Theory #1: People playing warlocks have often been playing them for a long time. As one of the original classes that seems to have always done good DPS, many warlocks have played since Vanilla. This was a reason cited by our recent warlock – seven years of playtime (in one game) is a lot. You’re bound to get tired of it eventually, right? Crackpot Theory #2: All the warlocks became DKs. This was a joke, but I’ve definitely seen a correlation between people who play DKs and Warlocks. Either warlocks have DK alts, or they switched to DKs when Wrath came out, or vice versa. Maybe it’s not that warlocks don’t last, it’s just that they all become plate-wearing pet-commanding disease-wielding deathmongers instead? (100% less fel). 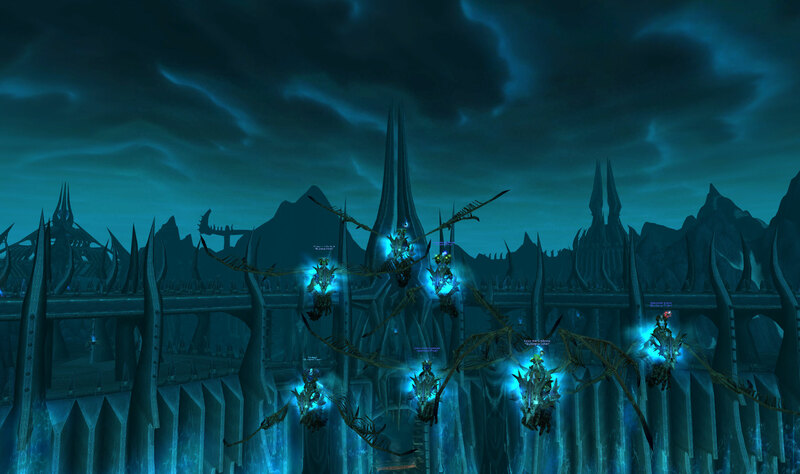 Crackpot Theory #3: Something about our guild is repellant to warlocks. Maybe we have too many Draenei. Maybe the anti-warlock sentiment is too strong, or maybe they just sense our inherent mageliness and think, “Nah, I’m out of here.” I’m not actually sure what it is, or if there’s any correlation to anything at all. But there has to be something, because we just can’t seem to hang onto a warlock! What do you think? Is your guild stuffed full of warlocks? Have you seen a dwindling of the warlock population? Do I need to try and find a “Care and feeding of your warlock” manual so that I can hang onto the next one (if we can find him or her?) I welcome any and all warlock conspiracy theories. p.s. – You may have guessed this from the post content, but we’re looking for a warlock. A balance druid or a shadow priest would also be welcome! I have just a few odds and ends for you this Monday afternoon. First of all, Business Time is recruiting! We’re looking for a dedicated and awesome healer to fill out our roster. You can check out our recruitment thread here for more info. The one class we’re missing is a resto shaman but we wouldn’t discount any other type of healer. All exceptional applicants will be considered. I’d like to note that even though recruitment in this expansion has been crazy and we’ve had to bring more new people on board than ever before, that I’m proud we haven’t had to resort to bringing people “just to make the numbers” that really aren’t a good fit personality-wise. We are a group of friends that loves to get things done and clear heroic content, but people have to fit in with our small posse first. We’ve never compromised on that account, and so BT continues to be a great place to play. You should check us out! The sooner we can find the right person, the sooner we can get ready to hit Firelands together. Now, for some link love! I’ve read some really great posts over the past few days. First up, check out When The Healer Says “Pull Bigger” over at Heavy Wool Bandage. Glorwynn has summarized everything that makes me irate when I’m on either a tank or a DPS character (naturally, as a healer I never tell my tank to do much of anything besides let me drink and don’t break line of sight). I’m not even going to try to express it, because she’s already said it so well. Zinn at Jinxed Thoughts has some interesting insights into the difficulties that 10s and 25s have faced so far in Cataclysm. Speaking as someone who has been focused on tens for as long as I’ve been raiding, I think these things are always interesting to analyze and think about. Well worth a read! 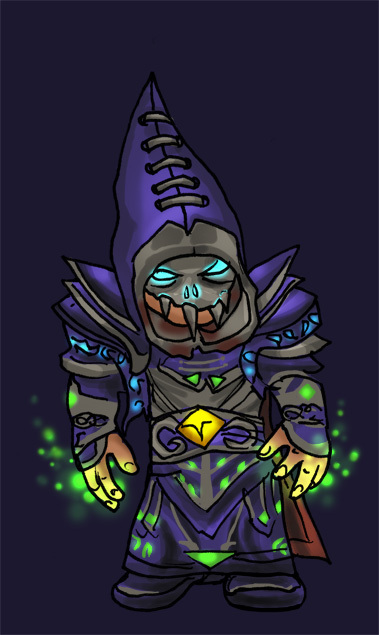 Finally, The Daily Blink writes a blog post to follow up the comic Lament Of An Ex-Mage. Remember the private hell of tanks and healers, my DPS friends, lest they forget where their taunt button is located! I’ve been the ‘recruitment officer’ in some capacity for my guild for almost as long as I’ve been in the guild. To be fair, this means something different in a ten-man group than it does for a big twenty-fives guild. We don’t need to recruit constantly or usually more than one person at a time. Because of our niche, recruitment has always been interesting. 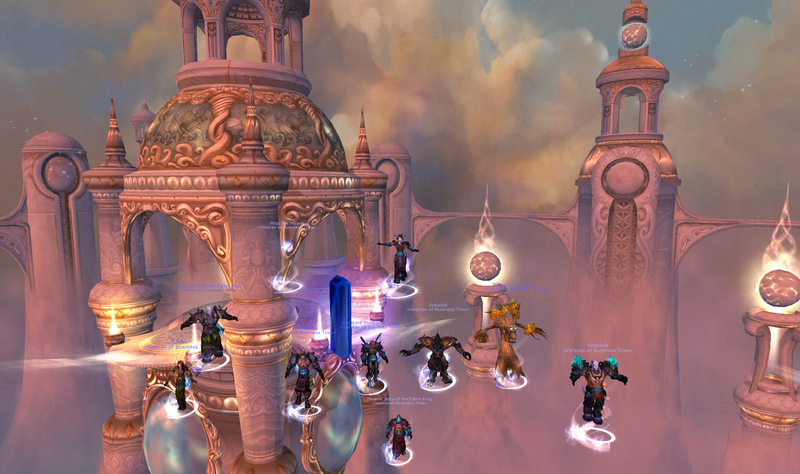 In some ways, it was harder because the vast majority of folks were looking for a “real” raiding guild (i.e. not tens). In other ways it was easier because there were very few tens-only guilds to serve the needs of those who were seeking them specifically. The balance of power has shifted in the recruitment forums. An explosion of ten-man guilds scramble alongside twenty-fives to try and fill their rosters at all levels of progression. The way that guilds snap at the heels of any prospective applicant is a pretty strong indicator that it’s a buyer’s market out there. Happily, the number of people looking for a tens guild is about evenly matched with those seeking a twenty-fives guild. This is good for us. Unhappily, hardly anyone is viewing my ads. Since Battle.net was integrated with the official Warcraft site, the forums have also changed. A change I’m really not happy about is the way that the guild recruitment forum was rolled into one biiiiig forum. It used to be that there was some division between Horde and Alliance forum. I can see why they did away with this – after all, since faction transfers exist there are many people willing to switch sides for their guild of choice. It’s okay to me that Alliance and Horde posts are mixed together, but I still think this forum needs vast improvement. Despite there being many other sites that have tried to fill the recruitment niche, none of them have ever really been as useful as the official forums. It’s a simple numbers game – if 80% of the population doesn’t know about or use your tool, then it’s not even worth the time it takes to register on the site. People ARE using the recruitment forums, but they’re a big mess. I propose that the forums ought to be divided into at least two sections – one for people seeking a guild, and one for guilds seeking people. I wonder if they haven’t done this because it would reduce visibility for guilds advertising? I’d accept that sacrifice in exchange for an easy way to browse through the ads of individuals rather than the hundreds of other guilds I don’t care about. There are external sites that work to alleviate this problem, which is kind of telling. If you need another website to navigate your forums, it’s possible your forums could use some tweaking. They could even sub-divide the forums: one subforum for 25s raiding and one for 10s, and maybe one for PvP/Other (although I’m pretty sure most RP folks aren’t using the official forums for the majority of their recruitment. An RP guild would have better luck on the ‘realm’ forums). The other obstacle facing recruiting guilds right now is a simple matter of supply and demand. So many new guilds sprang up for Cataclysm that competition for available players is fierce. I’ll be honest with you, I’ve been browsing the recruitment forums for over a year and I’ve never seen it quite like this. If you aren’t one of the first people to reply to someone’s ad, chances are that your interest will simply get buried in the deluge of ad spam that follows. It’s great for the people looking for a guild! There’s never been a better time to locate a guild that matches every criteria you have – server type, raid type, size and attitude. The flip-side of that is that it’s a difficult time to be a guild seeking personnel. As a guild leader or recruitment officer, you need to think about what makes your guild so different than the others also trying to attract a person’s attention. Are you more progressed, do you have better times for them? You know your guild is awesome, but you have to convince this person of that enough that they will apply. This also brings up the issue of quality. I’ve seen applicants advertising themselves that have, let’s say, 9/12 experience (with normal mode encounters). Which is fine! I’m not judging. But this same applicant will advertise that their guild of choice must have “at least” 6/13 hard-modes down. I can understand wanting to find a guild a bit more progressed than you are, especially if you are at a progression block in your current guild. You want to know that the guild you’re joining is pushing the content you want. But I can tell you now, if you personally have only done 9/12, there’s no way you are geared enough for doing the later hard-modes, at least in a ten-man guild. You would be a liability to that team until they were able to gear you further, and also until you actually learned the encounters. But these people will inevitably find a guild with that kind of progression, because that’s the way recruitment is right now. This is still a bit of a red flag for me, though – I wouldn’t want someone making those kinds of demands to join my guild. I’m pretty sure our attitudes towards perseverance and progression wouldn’t match up. It’s not that I wouldn’t recruit someone who hasn’t done any hard-modes, I might consider it if the personality and attitude were a match. Encounters can be learned. But in that case you are the one that has to impress me, not the other way around! First of all, are these people crazy? Posting up your Real ID in a public forum is just begging to be hacked. Hackers know it’s the same e-mail address you use to login to Battle.net in the first place, and you’ve just given them a key piece of information. So there’s the fact that it’s a security risk. Secondly, Real ID is intended to be a method of contact between real-life friends. It uses your actual name, unless you used a pseudonym when you first registered for Battle.net (You can’t change your name in the system without phoning a customer service rep, I looked into it). So you’re giving complete strangers access to your account e-mail and your real name without a second thought. I’ve seen recruiters that also include their Real ID information along with, “Here’s how you can get in touch with me.” Well, this is a fine pickle. I’ve actually been frustrated to see that potential applicants are having conversations via Real ID before anyone has even posted a “reply” to their ad. The advent of Real ID being used this way might mean that I miss out on potential applicants to my guild – and so be it, because I am not going to be giving out my first and last name to a complete stranger just so that I can ask them some questions about their tanking spec. The description section has a harsh character limit. Hence, I could not put a period at the end of that last sentence, or use the entire word "apply." That’s what ours looks like. Any requests your guild receives show up in the “Requests” tab where an applicant is also given space to send a message (although you can send a request without any message at all). So what do I think of the new tool? Well, any tool designed to bring a guild to the attention of prospective applicants is a good one. We’ve had a number of “requests” this way, but none of those people have actually joined the guild. There’s actually an “invite” button on the tab, and maybe some guilds would be happy to invite a member just on the basis of three sentences, but we’re not going to be changing our outlook on that anytime soon. People still have to go to our website to fill out a “real” application, and so this tool is an intermediary at best. Still, it increases visibility and might sometime gain us the right applicant so I don’t mind it. I hope they refine some things such as the “availability” section. 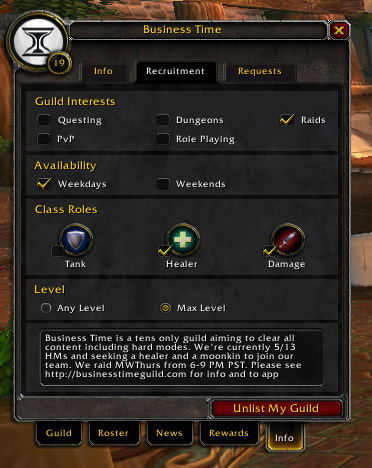 Plenty of people are available on “weekdays,” but are those weekdays the days my guild is actually raiding? Having said all of the above, though, all of our recent recruitment has been quite successful. When we needed a new tank we had to look at an unprecedented five(!) quality applications, and it wasn’t an easy decision. We found our holy paladin healer back in February reasonably easily (and I don’t think it was my clever ad that attracted him either, more’s the pity). Recently we had our fury warrior swap to healing and subsequently recruited a friend of an existing guild member to fill the slot. This is naturally the ideal – never having to resort to “cold” methods of recruitment at all. If you can find quality people via word of mouth or existing contacts you are reasonably assured that the applicant will be a good fit for your guild at least in personality, and you also have someone to vouch ahead of time for their quality of play.